Many studies show a high rate of alcohol abuse among men who batter their female partners. Yet is there really a link between alcohol abuse and domestic violence? No evidence supports a cause-and-effect relationship between the two problems. The relatively high incidence of alcohol abuse among men who batter must be viewed as the overlap of two widespread social problems. Efforts to link alcohol abuse and domestic violence reflect society’s tendency to view battering as an individual deviant behavior. Moreover, there is a reluctance to believe that domestic violence is a pervasive social problem that happens among all kinds of American families. For these reasons, it is essential to emphasize what is known about the relationship between alcohol abuse and domestic violence. • Battering is a socially learned behavior, and is not the result of substance abuse or mental illness. Men who batter frequently use alcohol abuse as an excuse for their violence. They attempt to rid themselves of responsibility for the problem by blaming it on the effects of alcohol. • Many men who batter do not drink heavily and many alcoholics do not beat their wives. Some abusers with alcohol problems batter when drunk, and others when they are sober. partners when not under the influence of alcohol. • Data on the concurrence of domestic violence and alcohol abuse vary widely, from as low as 25% to as high as 80% of cases. • A battering incident that is coupled with alcohol abuse may be more severe and result in greater injury. • Alcoholism treatment does not “cure” battering behavior; both problems must be addressed separately. However, provisions for the woman’s safety must take precedence. from violence, women should receive assistance for substance abuse problems in addition to other supportive services. • Men living with women who have alcohol abuse problems often try to justify their violence as a way to control them when they’re drunk. A woman’s failure to remain substance-free is never an excuse for the abuser’s violence. Most people believe that battered women will be safe once they separate from the batterer. They also believe that women are free to leave abusers at any time. We have all heard, “All she had to do was leave; she brought it on herself.” The unfortunate fact is that leaving does not usually put an end to the violence. Batterers may, in fact, escalate their violence to coerce a battered woman into reconciliation or to retaliate for the battered woman’s perceived rejection or abandonment of the batterer. The man who believes that he is entitled to a relationship with a woman or that he “owns” her; views the woman’s departure as an ultimate betrayal which justifies retaliation. Evidence of the gravity of separation violence is overwhelming. One study revealed that 73% of the battered women seeking emergency medical services sustained injuries after leaving the batterer. Another study showed that over ¼ of the women killed by their male partners were attempting to end the relationship when they were killed. Although leaving may pose additional hazards, at least in the short run, the research data and experience demonstrate that ultimately a battered woman can best achieve safety and freedom apart from the batterer. Leaving requires planning and legal intervention to safeguard victims and their children. Victim advocates and battered women must work in partnership to assure that the risk of violence is minimized the separation process. Getting out of an abusive relationship is not easy, but it can provide an opportunity for you and your children to live a life free of violence. Seeking counseling and support when you end a violent relationship is crucial for you and your children. 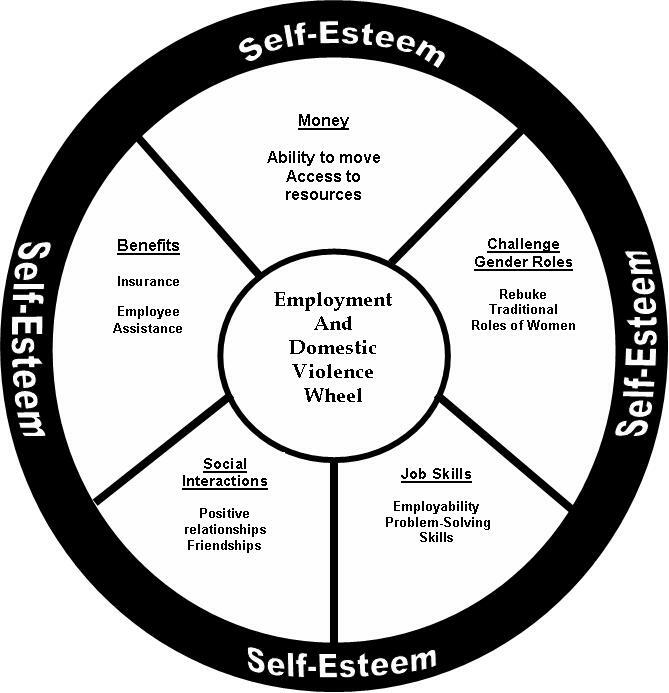 The Domestic Violence and Employment Wheel describes how a job can act as a “protective factor” in prevent abuse. It describes the benefits that work provides to victims and conversely the reasons why abusers try to prevent the victim from being employed. While being “gainfully employed” does not prevent abusive relationships in every situation, employment does provide the key support systems that can help a victim in different ways. The purpose of the model is to illustrate the value of work in preventing and leaving abusive relationships. Especially when the victim and abuser cohabitate, money may provide the victim the literal means to leave the abusive relationship. Getting the taxi or gas to travel to a hotel room or another city requires financial resources. Establishing a new place to live may include a down payment for mortgage or rent, setting up utilities and other costs of moving possessions. Civil legal actions, medical bills and other services require resources which would be difficult for a person financially dependent on the abuser. Money simply provides flexibility and more options for victims. Just by being employed, victims are gaining skills that make them more independent. Every job provides a person with problem solving skills which will have direct application towards their ability to be independent. While employed, new skills are developed which allow for promotion and advancement. Having a consistent work history is more attractive to potential employers. If a victim chooses to relocate, these skills make it easier for them to begin their life anew. While support services vary, employment often offers programs such as Employee Assistance Programs, Occupational Health, Wellness and Security. It is these services which may provide contact with the local community victim service agency. Just as important is the additional financial support of heath care insurance which may include mental health services. While not a benefit per se, employment does challenge stereotyped gender-roles. As domestic violence often impacts women, it is the conventional position that men should be the “bread-winners” while the women stay at home. It is this perpetration of male dominance that denies women the right to obtain meaningful and rewarding employment. While there have been strides in ending such discrimination, this view is still held to deny a woman’s right to work. Even if they do work, it often still the woman’s responsibility to care for the house-hold (laundry, cooking, cleaning, care of children) and lapses often become the excuses for the demand for her to quit. While abusers commonly use isolation as a means to control, employment provides the victim opportunity to find friends and be exposed to positive relationships. Supervisors and co-workers can offer praise and encouragement, a different message from the criticism and put-downs that the victim often continually hears from the abuser. Friendship is a powerful support mechanism in that it can offer a listening ear, advice, a place to stay and other assistance. All of these components, including the simple fact that they are employed, provide a victim with building blocks for greater self-esteem. Having a position and being part of an organization, no matter the title or company, gives a person a sense of identity. Knowing that they have a role, responsibility and a place that they are needed, a victim may recognize their own self-worth. Combined with money in the bank, employability, belief that they have the right to work and knowing others who respect and care for them, a victim is more likely to refuse the abuse that endangers their well-being and even their life.